It’s like you get to eat a light meal with some famous people, and they each get four minutes of your time. Aside from any social faux pas that would inevitably happen, you’d have the essence of this book. Between the “Courage and Confidence” cauliflower dip, the “Tenacity and Perseverance” finger sandwiches, the “Mentor” mint- meatballs, and the “Passion and Dreams” bacon wraps – you’ll get your fill of advice dished up. But just like dinner with the relatives, it’s best taken in small doses spread out across time. Pick a topic or pick a personality and enjoy a quick bite for a day. Ruminate on it throughout the day. I loved having Topic and Author both listed in the Table of Contents so that no matter what I was hungry for, I could go right to a specific page desired. I feel the book is really meant more for a “Business Casual Friday” side of life than a Spiritual side. However, anyone graduating or just starting a journey, (and who isn’t?) could gobble up some fun insights, even if it is just an appetizer from this easy to read book. 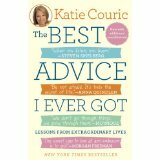 This entry was posted in Book Reviews and tagged Celebrities Advice, daily inspiration, hors d'oeuvres, Katie Couric, Light Business Inspiration, The Best Advice I Ever Got by MomentumMikey. Bookmark the permalink.